You are here: Home / sauce / Blue Cheese Dressing – Super Chunky! 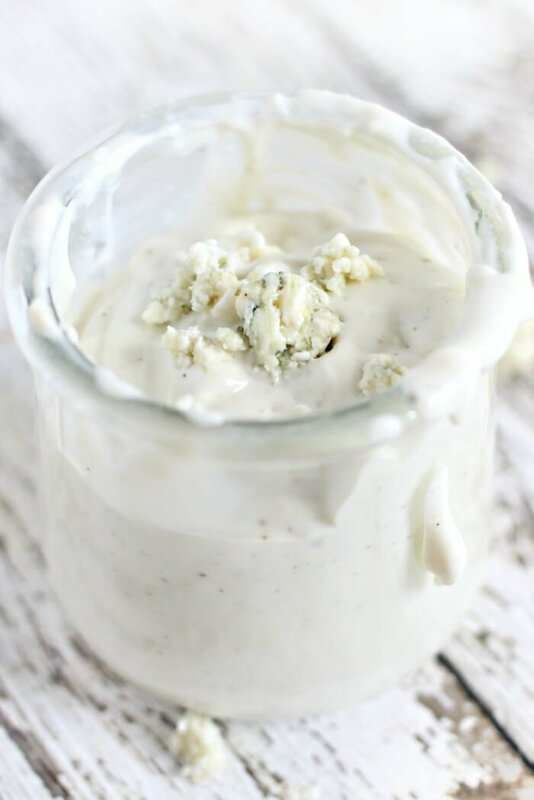 Blue Cheese Dressing – Super Chunky! 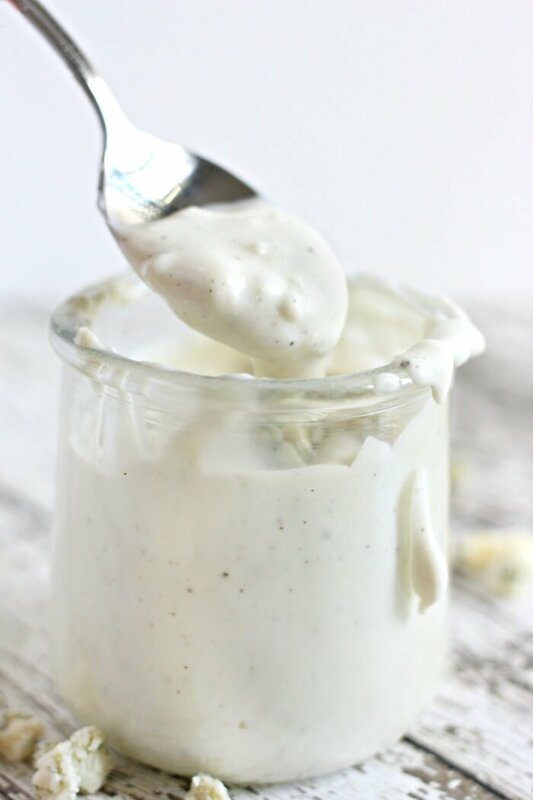 This Blue Cheese Dressing is super creamy, super chunky, super delicious, and super easy to make! I can’t believe it took me so long to make my own blue cheese dressing. Oh my goodness, you guys, this blue cheese dressing recipe is 100% amazingly delicious perfection. My mother-in-law and I keep sneaking spoonfuls out of the jar. 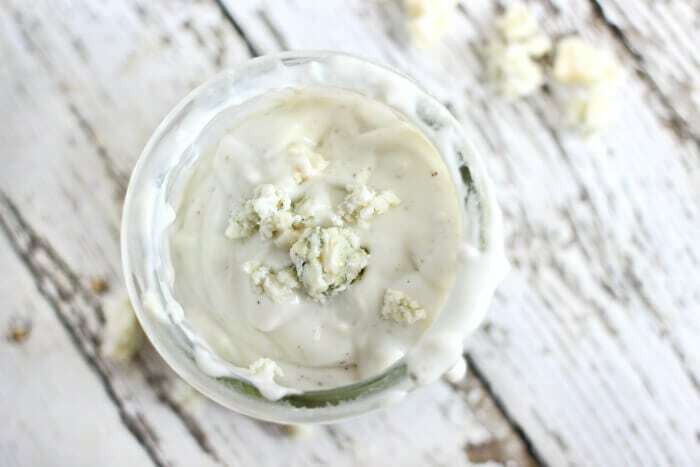 You know I’m obsessed with homemade salad dressings and homemade marinades, so this homemade blue cheese dressing (or is it bleu cheese dressing?!) was a natural addition to the recipe roster. 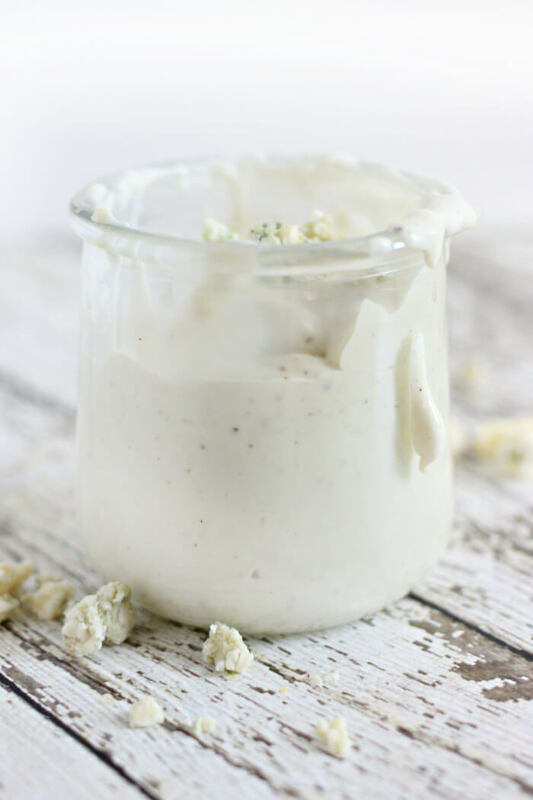 How do you make homemade blue cheese dressing? 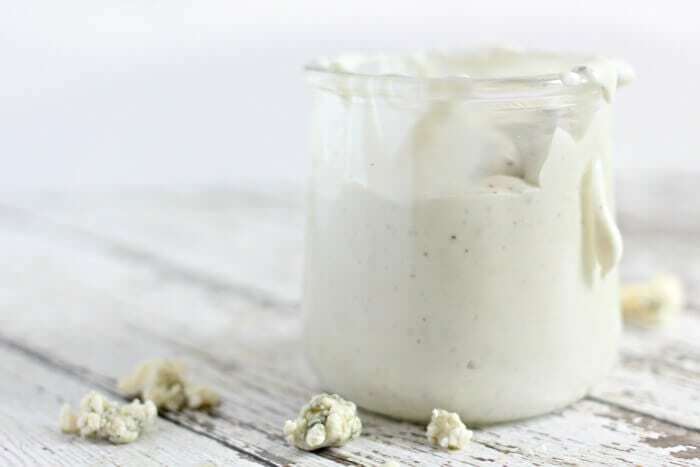 Our homemade blue cheese dressing is made with crumbled blue cheese, sour cream, mayonnaise, lemon juice, and spices. As with any recipe, the end result is going to depend on what you put in it. So go with a great quality blue cheese, and full fat mayonnaise and sour cream. 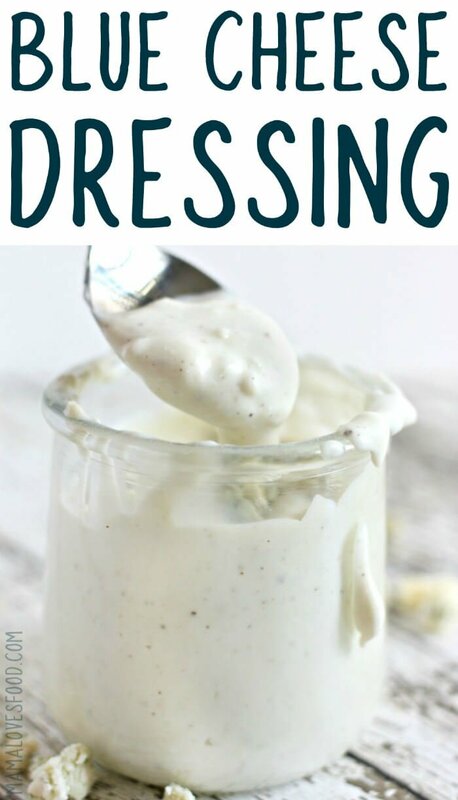 You can make it with the fat free or low fat stuff, but you’ll get the best thick and creamy blue cheese dressing if you use really great whole fat ingredients. 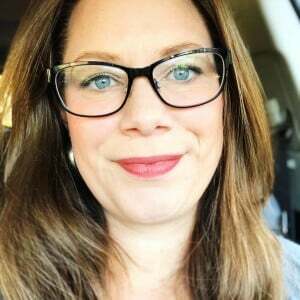 Can I eat blue cheese salad dressing while pregnant? Whether to blue cheese dressing while pregnant is going to be a personal call. I ate it sparingly, and often heated it first (and then poured it over a good seared steak, yum), but not everyone is comfortable with the risk involved. How long can you keep homemade blue cheese dressing? You can keep homemade blue cheese dressing for as long as the individual ingredients are good. More specifically, take a look at the expiration dates of each of your ingredients, and find the one with the earliest date. That’s the expiration date you’ll want write on the bottom of your jar. Make sure to use something that won’t wipe off, like a sharpie, or a sticker. Is blue cheese always pasteurized? Blue cheese is not always pasteurized. Pasteurization is a heating process that kills microbes, mainly bacteria, in food and drink. If you want to use pasteurized blue cheese for our blue cheese dressing recipe, definitely make sure to read the blue cheese labels closely. Creamy Apple Cider Vinaigrette Dressing – Creamy apple cider vinaigrette salad dressing in four easy ingredients. I bet you have everything in your pantry right now! 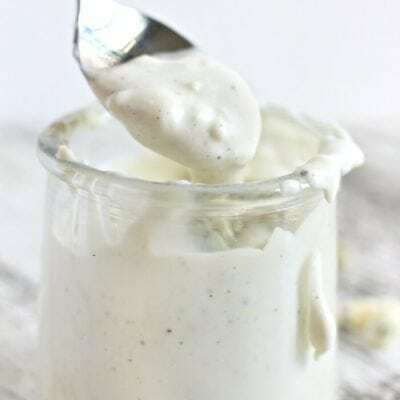 Homemade Buttermilk Ranch Dressing – This is the dressing that made me realize how easy it was to make homemade salad dressings and I’ll tell you, I haven’t bought a bottle of ranch dressing since. Balsamic Dijon Salad Dressing – This dressing also doubles as a marinade! Put it over your steak salad, or just put it over your steak! OXO Good Grips Green Salad Spinner – I know this sounds like a silly tool, but you guys. Salad spinners are addicting. Once you see the volume of water that comes out of what you previously considered ‘dry’ lettuce, you’ll be hooked! Anchor Hocking Glass Cruet With Stopper – Because what’s the point of making your own salad dressing if you don’t have anywhere to put it? Lipper International Small Bamboo Bowls, Set of 4 – As someone who doesn’t gravitate toward eating salad, I like to do all the things possible to make sure my salad looks super appealing. And that includes awesome salad bowls. Lipper International Bamboo Salad Bowl – And what good is a salad bowl to eat out of if you don’t have a cute one to serve out of? Vremi Wooden Spoons Bamboo Utensils with Colorful Handles – See also: matching utensils. My Creamy Blue Cheese Dressing deserves only the best. You can also watch us make this blue cheese dressing on YouTube along with a giant cobb salad! Make sure to tune in for all our live cooking shows! Combine everything EXCEPT ½ cup of blue cheese crumbles. Blend well with an immersion blender or upright blender. Stir in remaining blue cheese crumbles. Calories are based on 2 tablespoon serving size. I’ve never made my own, this is genius! Can’t wait to try! Looks yummy! Can’t wait to try. Didn’t imagine it would be this simple. Thanks. Can’t wait to try this my own! Why do people always say they can’t wait to try? I thought I could find out if it was good tasting but everyone just said they can’t wait to try. Has anyone actually tasted this? what’s the nutritional information for this recipe? More particularly, the carb count. Yumm, super fantastic tastling blue cheese dressing.. great for dipping other cheeses in.. oh yeah, wings too! This is a great salad dressing and great on wings. Does this get runny the longer it sets? Seemed creamy when I made it and now a few days later is runny. No it should not get runny, if anything it should be thicker. You are keeping it in the refrigerator, correct? Also make sure to check your use by dates. It was almost too thick after sitting in the refrigerator. Is there a way to thin it?